The TGS Production Forecast Database is a Microsoft SQL Server library of every active well in the US containing both a monthly production projection and EUR total. When combined with the Longbow desktop visualization tool, entire EUR basin studies are generated in minutes. This forecast engine leverages the TGS Well Performance Database to create forward production curves for all active producing wells, derived from historical, time-series production data. Wells are forecasted to economic limit and curves are generated utilizing hyperbolic fitting but this model’s unique advantage includes Extended Kalman Filter (EKF) techniques incorporated into the process. EKF emphasizes the most recent data, identifies trends and adjusts logic on the fly using a series of matrix math techniques, resulting in improved efficiency and accuracy. It is the first time to our knowledge EKF theory is used in oil and gas forecasting. The image below shows a Delaware Basin side-by-side assessment of EUR values and GOR calculations. 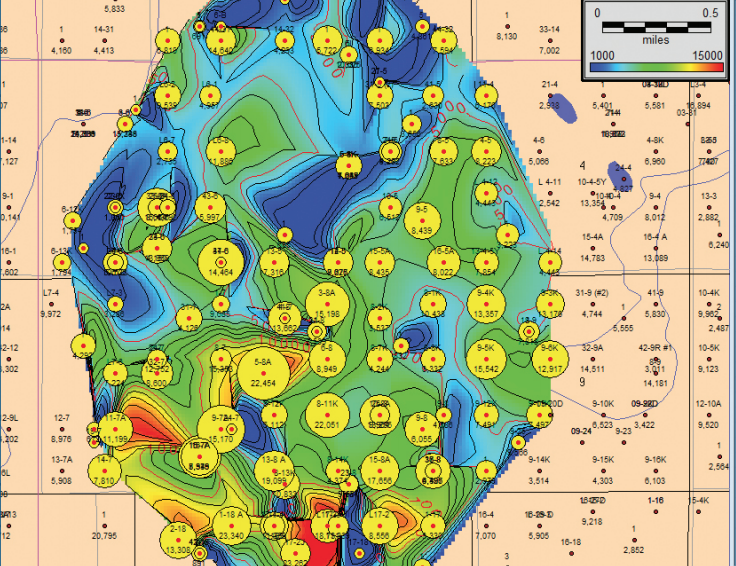 The left map, EUR Hot Spots, identifies spatial patterns of high-value wells and acreage. The right map, comparing wells by GOR value, interprets the oil & gas window in the play enabling asset evaluators to identify commodity streams of choice, and acreage value correlated to the major phase. We understand that identifying the precise training needs for your organization is crucial to success. Our talented TGS trainers then will work closely with you to ensure a smooth transition from installation to integration and all LONGBOWTM users are entitled to a free, recorded onboarding training session delivered to your inbox at the point of installation. For more information on how to begin a training needs assessment, contact our support team at LongbowSupport@tgs.com.